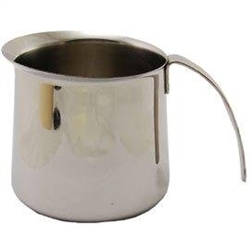 Krups XS5020 frothing pitcher, with its stainless-steel polished-to-mirror-finish outside and brushed inside, works great for frothing milk to make cappuccinos and cafe lattes. This pitcher holds up to 20 ounces of milk, and its long easy-grip handle and drip-resistant lip ensures graceful pouring. Remember, the frothing pitcher cleans up quickly by hand or in the dishwasher. The pitcher measures 5.3 by 4.67 by 3.8 inches . Krups Artese Filter for Espresso Makers 088 Braun Tassimo Piercing Unit 7050956 Krups Espresso Machine Frothing Nozzle MS-623107 Krups Stainless Steel Frothing Pitcher 12 Oz.